I originally got my Technician license because I wanted to be able to communicate in the many areas of our ‘mountain region’ that don’t have cell phone coverage. That was a nice start – a 5W HT and good antenna got me to the local repeater without too much trouble. But not long after getting licensed, I learned about packet, and in particular, APRS. APRS tickled my fancy in a number of ways – it combines computers, cars, radio and GPS! I was hooked. I built a tracker kit, hooked it to my GPS and a recycled HT, rigged up an antenna on my car, and got a kick out of watching my car (and other cars) move around on maps. Be warned – learning about APRS can be a lot like drinking from a firehose. There are trackers to understand, RF infrastructure to look for or build, an Internet component that vastly extends the RF infrastructure, and lots and lots of websites with often conflicting (or seriously out of date) advice. That was the end of the original concept; people hooked up packet stations and watched the activity on their computers and, eventually, on specialized radios like the Kenwood TM-D710G, and the TH-D72A. 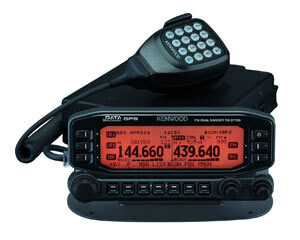 If any of that sounds like fun, then APRS might be for you. If you have an old packet station, you can get started right away. The basics of getting a glimpse of local activity is captured in a very nice article by Richard Parry, W9IF, on the ARRL website. Even if you just have a connection to the Internet, you can get involved. Those sites, as well as programs like Xastir, UI-View, WinAPRS and many others will let you see what activity is being reported via the APRS-IS system – that is, the Internet side of APRS. 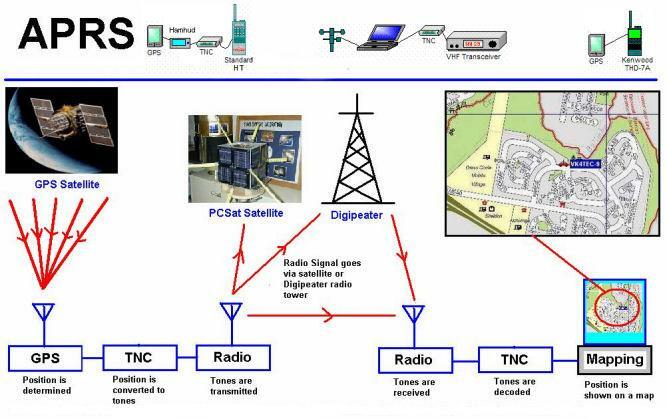 If you add a TNC and radio to your computer, you can watch the RF activity as well – some of it probably doesn’t make it to APRS-IS. If you’re in a good location, you can help fill in a coverage gap with the same software! However, if you look at the local activity, you’ll see that there isn’t much. That’s partially because, until recently, there has been no APRS infrastructure (no digipeaters) around Oakhurst. Jeff KF6CNV and Chris K6DBG have been working to change that – there is now pretty good coverage along 41 and 49 through our valley, and more to come. Now that packets are getting out, we hope to attract some users. Which leads back to “why?”. It’s kind of fun to put a tracker in your vehicle, at least if you’re of a certain bent. It might let your OM or XYL know where you are when you’re out of repeater/cell phone range. As you drive around, a rig like the TM-D710G will let you see what other APRS activity is nearby, including what repeaters are good to use nearby. SAR teams use trackers and APRS to manage rescue efforts. If you carry a TH-D72A with you while hiking or climbing, you can get local weather information and send email! But a great place to start is the way many people seem to: connect an OpenTracker USB or TinyTrak, a GPS and a 5W HT to a mag-mount antenna on top of your car or truck, and drive around with it for a while. See if it’s useful or at least fun, and then decide if you’d like to go farther with this aspect of the hobby.